In leadership training, we talk about “Flow” as an important state for getting high-results and being motivated. Here is an example of Flow from my own life. As you read it, see if you can spot the key ingredients required to get me in this state of Flow.. In 2002 I was living in Brussels. I didn’t have any kids and I was “away from home”. One day, I was thinking about how I could better share my life with people in England. At the time, Facebook probably existed in the US, but it wasn’t part of our daily life like it is today. I wanted to let people know what I was up to, share stories and pictures and have more contact with them. One Saturday afternoon at 2pm, I decided to make a website. What I saw was a blank “internet page” with “Welcome to my webpage” in the top-left corner, font times new roman, size 10. I quietly smiled to myself and moved onto lesson 2, which was about how to make a link. I made a new notepad document with the HREF code for a link and linked it to my first page with the text “Click here”. When I opened my new page, I saw a blue link in the top-left saying “Click here”. I did. It opened my first page. I was very excited. I went on through the lessons: How to change background colour, adjust font, add tables, put in pictures, make frames, add a form for email contact, add buttons… Each time, I slowly learnt something new and watched my pages come to life. I carried on working non-stop from 2pm to 4.30am the next day. I only stopped a couple of times to go the toilet and I had a “dinner” in less than 10 minutes at my desk. By the time I finished, I had my first working website, uploaded via FTP and shared by email with my family. It had a kind of diary in it, some pictures and I had plans to add more later with my new skillset. This is a perfect example of flow for me: I got the best results I could get, I was happy and time flew by. According to positive psychologist Mihaly Csikszentmihalyi, this positive state of flow is what everyone wants in life. It is a state of motivation where we feel good and get the best results. If we are under stimulated, we get bored (and bad results) and if things are too much for us, its stressful (with bad results). Flow is the key. If you are thinking about how to motivate your people at work, there are lots of practical ideas of what you can do to create or maintain flow. My training participants have been coming up with many ideas. You can see some on this padlet wall and this other wall. Its not difficult to do and the impact on employee results and happiness is enormous. So, go: Get your people in flow! During the Wednesday morning ASTD2013 session with Karl Kapp, we were “sold” on Gamification for learning. Session W306 with Julie Dirksen filled in some of the design gaps. If, like me, you believe gamification for learning is worth exploring, you might be getting started on your first attempts at game design. When you have your basic idea for a game or how to bring game-mechanics into a learning initiative, what do you need to keep in mind to be successful? What specific game design principles must be followed? Julie Dirksen suggests the following…. Dirksen says that to create good learning you need to give extremely frequent feedback, in diverse ways. EA sports games are designed so you have to make a decision every 1-2 seconds and you get feedback on this every 7-10 seconds. Knowing where you are and how your behaviour has impact on results is important to keep players in flow. 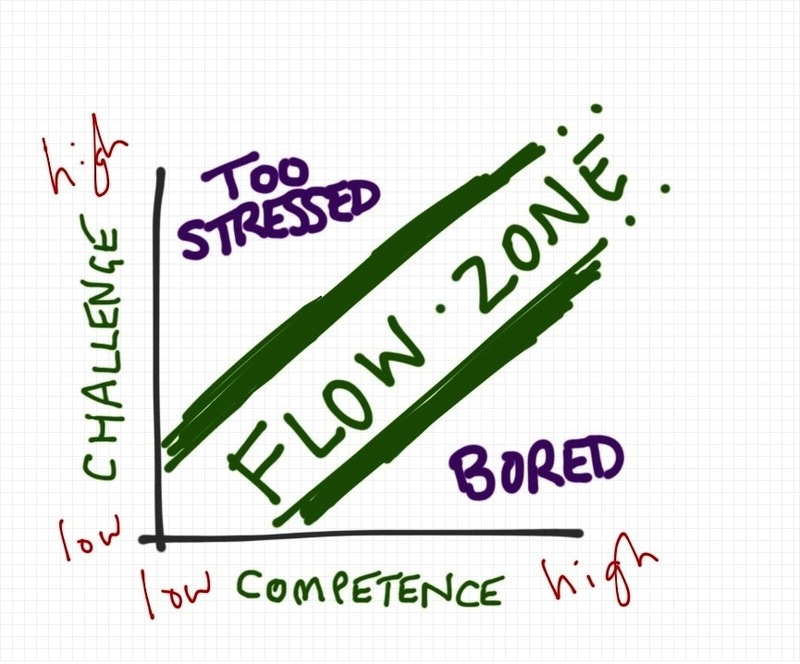 Flow is one major reason why gamified learning is more motivating than non-gamified learning. As your game starts, build in feedback mechanisms that help players to learn how the game works and how they can progress. This approach is also used a lot in video games. The player is taken through simple situations in order to learn the rules of the environment and how to control her actions. When enough feedback has been given to really understand the basic principles, we can throw in something to take them to the next level of the game. Another important element in giving feedback is to make it seem more “consequential”. This means that the feedback style itself is linked to the context or impact of the behaviour that leads to it. The example given is of a safety/security training: Instead of giving a simple verbal or text-based feedback that says “wrong answer”, players get a big noisy “BOOM! !” sound with a scary message about having just blown up the facility. In this way, the feedback style is linked to the desired learning and the environment in question. According to Dirksen, these kinds of feedback approaches are far more effective than random badges and points that go no-where. When Dirksen asks “How long can you pay attention to something?” the participants of session W306 are careful not to give big numbers. Thinking of our own school experience and what trainers tell us in “Presentation Skills” training, we know it can’t be too long and we answer “about 10 minutes”. Dirksen spoke to us about the way rewards should be used in gamified learning. So unless you have a really good pay-off, bring in game rewards early on. Rewards also have to be meaningful to the learner. Random badges, points and prizes do not improve game performance over time. Dirksen gave the example of how the inherent reward of the learning itself in a maths class could be better tailored to fit participants by using problems and examples that are related to their own reality. For example, for future entrepreneurs who need maths training, rather than creating a random maths game, you could create a maths-game around the ideas of successfully running a business. In reality, call-agents do not see the logos of their competitors when they call. The game did not involve the actual behaviours they should look (or listen!) out for. Most call-agents do not have guns at work 🙂 The winning game behaviour did not match the desired real-life behaviour. The game-behaviour was very aggressive and might encourage call-agents to be aggressive towards any competitors they did encounter in their calls. Having listened to Dirksen and Kapp at the ASTD2013 ICE, I had the opinion that many elements of my own training could be dramatically improved by the use of game. But even if I don’t want to gamify things, I think it is important to align training with these principles of feedback, attention, reward, deliverables and challenge. Non-consideration of the connection between specific goals you are working on and their link to personal values, vision and belief may lead to burnout. Being extremely productive does not mean you are working in-line with the “real you”. Read here for other causes of burnout or have a look at this burnout risk self-test and some ideas from mindtools.com on avoiding burnout. Re-reading this list, the “thin-red-line” that holds it all together seems to me to be the idea of “getting lost” in something, losing work-life balance or the feeling of “wholeness” and general life-satisfaction. Lack of inspiration or sudden disillusionment for the work you had previously been doing with lots of motivation and effort. You can read more about this in the introduction to burnout from mindtools.com. Inability to “get started” on things. This could range from a kind of apathy for “life in general” to one specific moment of literally not being able to get out of your car to go and visit the client you just arrived at. Stop working. Turn it all off. This is probably the hardest first step for people suffering from burnout. Daring to stop is tough. Many people suffer from “Information Deprivation Disorder“. Believing the world will carry on without you and you’ll be OK is even tougher. If you work for yourself, add to that the false idea that no-one will ever hire you again and you are set to keep on working even when all the signs say stop. You need a leap of faith to make this first step, or an intervention from someone else, or a complete breakdown or putting your back out or…. But it has to happen. Stop. Do things that please you. This is a tough one. If you are feeling depressed and someone says “Do things that please you” it is likely you won’t have any idea what to do. Nothing pleases you! But if you can think of just one little thing you wanted to do at some point, but didn’t (because you we’re doing too much or working too hard) now is the time to do it. Go surfing. Play your guitar. Read that novel. Get a massage. Watch a movie at 1pm while the kids are out. Lie on the grass and walk in the snow. Not everything needs to have a reason and these previously seemingly irrelevant things that don’t advance your project or career need to have their space too. Start now. …but don’t throw the baby out with the bath-water. If you are burnt-out, you might get to thinking its a good idea to quit your wife, your job, your kids or sell the house. Don’t. Those are big decisions that need to be made with good mental health. Although you might get the idea that the causes of your burnout are all interlinked and therefore one major change will affect everything else, this doesn’t mean that the results will be positive and you are certainly in no state (yet) to implement massive life changes. Slow down! Sleep if you need to. Although at some point you will have to “get up and get on with your life” don’t be too tough on yourself. If you feel you need to sleep, do it. You are exhausted from the rhythm of your life to-date. Take the time to get your breath back. Move a little. Get out for a walk or do sport. Before burnout you were probably doing the same things in the same way all the time. Now you are taking a break from that. Although you may well spend a fair bit of time sleeping or doing nothing, just getting outside for a little fresh air and gentle movement can make a massive difference to your physical state and your mood. Find a way to express yourself on the subject. In a certain way, burnout can be seen as the previous non-expression of some part of you that now forces itself to be heard. (If you don’t understand what I mean, read “I think therefore I am. Not.“) This could be any facet of your ego/personality, but whatever it is, it refuses to lay down and let the intense workaholic one-track mind takeover anymore. You need to give that part of you some space. In the film “The Beaver” with Mel Gibson, the main character Walter Black (who is suffering from depression) manages to express another previously-silent “brighter” side of himself by wearing and speaking through a puppet. Although this film is not a lesson in how to deal effectively with burnout and depression, Gibson’s character at first finds a way to say what is on his mind and share with his family and friends. There is no shame in burnout and no reason not to share. Don’t think people are judging you. Mostly, they are not. People understand. And if you are an engaged, highly motivated passionate worker like many burn-out sufferers are, chances are that some of the people you hang around with will have had their own experience with burnout. As for everyone who judges you and thinks bad of you for your burnout: It will be hard to do, but you have to let these people go. They are not helping you and they don’t love you. Get advice, even from non-experts. Don’t try and do everything alone. Many other people have already lived what you arriving during burnout and there are plenty of experts out there, from medical professionals to life-coaches. But there are also friends and family, business acquaintances and random strangers. They might have something useful to say, something that enlightens you a little to your situation, style or options. If you trust these people, why not listen to what they have to say? And let’s face it: If you burnt out already all by yourself, you could probably use a little help from someone else. For more ideas and resources, check out this very complete page from mindtools.com about recovering from burnout. It includes ideas about changing jobs and other things i have also written on like doing a SWOT analysis and creating strategic action. When you buy a nice new car, you tend to look after it. You get it serviced and you keep it clean, topped up on all the right fuels and oils and filters. It runs for years and you continue to love it. If you don’t service it and follow the maintenance instructions, one day you find yourself stuck on the side of the motorway, loaded down with bags and screaming children, no longer able to go on holiday and wishing you had done it differently. It is easy to go through life at 120km/hour. When you are new to a job, young, fit or successful and healthy it’s easy to give 150%. When you can see the results that that gives and you want to grow even more, it’s easy to just keep going. But if you don’t sharpen the saw and maintain yourself, you will eventually breakdown. With a little luck you will have a burnout. If you’re unlucky, you’ll have a heart attack. Even a Ferrari needs to stop moving from time-to-time. Realise that life is an opportunity to express different sides of yourself, not just one. Even if you are the CEO of the biggest company in the world and you made it all yourself, you are still a father, musician, husband, lover, runner, writer, fun person etc etc as well. Those sides of you need to have room to breathe and flourish. When you are feeling a little better from your burnout, sit down and list the different things you like to do and be and how you will help them to have more space. Make a schedule for a balanced life. At work, you plan time for the activities and projects that have the most importance. That is what they teach you in leadership courses and management classes. The same must be true for “post-burnout you”. If you think it is important for your physical and mental health to do some sport, plan it. If you wish you spent more time eating dinner with the family, plan it. And on the work front, if you hate admin and can only stand to do it one day a week, plan for it one day a week. Get a post-burnout buddy. This could be a formal coach or just a good friend. But you need someone to help keep you stay on track. Burnout happens a lot to people who think they are indestructible entrepreneurial self-starters who can do and be anything they want. If you already burnt-out you know that this is not the case. To avoid the risk of just doing it again, find someone with whom you can discuss your plans and promises and who can call you up from time-to-time to see how you are doing. I hope this post helped. Maybe you will realise that you need to take action now for the future, maybe you know someone who is having a burnout and this will help you help them, or maybe you can think about preventative actions for your own organisation. If you have an experience to share or a reply to any of these ideas, please comment. What follows is a short article Tim wrote to share with other members of my LinkedIn group “Leadership Foundation”, where previous participants and people interested in the topic can share references outside of training. I think some of what you can read here is a great example of getting and staying in Flow – a wonderful story of intrinsic motivation and awesome success, despite drawbacks and a very busy life. As a fellow marathon runner, I know what it takes and Tim has done a great job! In June 2011, I followed Dan’s “Leadership Foundation Course” at Ghent University. During one of his classes on prioritizing, Dan stressed out that if something is really important, you just do it. If you don’t do it, it means it isn’t important. This struck me, as I always said to myself “one day, I will run a marathon”. Up to that day, I didn’t run it, it was one of the things on my bucket list, something I wanted to prove to myself but I hadn’t done it yet… Was it really important to me? I didn’t want people to mock me as “the guy that runs a marathon with his mouth but not with his legs”… So, on that very day I made the decision that in 2012 I was going to run a marathon! I had some running experience previously but I never ran further than 15km. In August 2011, I started training 3x a week to run a half marathon. I accomplished this goal in November 2011. It was hard, but I enjoyed the race and achieved my time goal as well. Ok, this was only half the distance I needed to run and winter was coming up which makes training harder… I decided to maintain my level of training throughout winter and spring and use summer to get in shape for the complete marathon. In April 2012, I needed to pick the marathon I was going to run. I felt I needed something big, not a race where only 5 people and 6 horses are watching. So I enrolled for the New York City marathon. This was it, the registration was final, my flights were booked, I had some supporters to join me, now I really had to run the race, no way back… I had my physical condition tested in the University Hospital in Ghent and via a mutual connection, I got in touch with a multiple Belgian marathon champion. My new coach did a test run with me and gave me a schedule for 6 weeks after which I had to do a test over 5km to see how my progress was. We are now August 2012. The schedule consisted of 5 trainings a week: 2 interval training (very fast and exhausting), 1 very long and slow training and 2 recuperation trainings. As I still had my daytime job to do and I’m also involved in a contemporary dance group (for which I have to train 3 evenings a week), I knew I was going to be busy the next couple of months… Some days were quite hectic: getting up at 6h, starting work at 7h, finishing at 18h, going home and eat in a quicky off to dance class, returning home at 22h, suiting up for a run of 1 and ½ hour, taking a shower and going to bed at 1h. But I really wanted this, I wanted to run the marathon, I wanted to prove to myself I could do it, I wanted to be an athlete and I wanted to be able to say “one day, I ran a marathon” instead of “one day, I will run…”. Two weeks later, after all the training, the disappointment, the new trainings, I was more motivated than ever before. I was going to Valencia and I was going to give it all I’ve got! And so it happened that last Sunday November 18th, I finally did it. I ran the marathon of Valencia in 3h 23min 59sec. I was hoping for a time under 3h 30min and I achieved my goal. During the race, after 32km, I endured a pain I had never witnessed before but I kept going. Pain wasn’t going to stop me, everyone was suffering at that point, I had to succeed. Despite of the pain, I enjoyed the race. The atmosphere was great, especially during the last kilometer. When I entered the “stadium” were the finish line was and I heard the roaring sound of the crowd, my legs felt brand new and I sprinted like reborn to the finish line. I was an experience I will never forget, for that one moment I really felt like an athlete at the Olympics with thousands of people cheering for me. Once I crossed the finish, I was barely able to walk normal and I thought to myself “When did I ever had this stupid idea to run a marathon??!!”. But a couple of hours later, I was thinking “Actually, this was pretty cool, I might do it again one day…”. Designate a room for conf-calls, rather than letting everyone on the floor follow the call ! For more information about Sun Tzu follow this link. To read “The Art of War”, follow this link – position is the key to strategy! Prepare a 1 minute presentation of yourself – anything is fine, we just need some data to use for a feedback exercise, so no stress! Read about logical levels – interesting to use in coaching..?